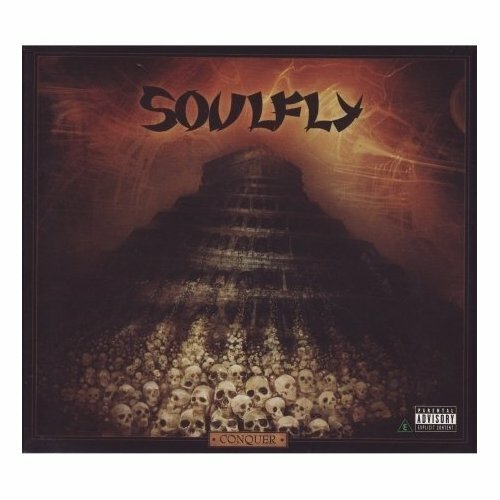 I’m a longtime Sepultura fan, and when Soulfly’s first CD came out, I thought it was good, but a little too nu-metal. I remained a fan of both groups as their paths took them in different musical directions over the following decade. After forgetting about both for awhile, I rediscovered them through Cavalera Conspiracy, which although good, didn’t have enough musical diversity to make me want to have repeat listens. After reading a few reviews of Conquer on wikipedia, I decided to give it a chance. Man am I glad I did. This is the best CD I’ve heard from Cavalera since the Roots/Chaos A.D. era. Every single song has its own unique sound, and they all work together to make an amazing album. I haven’t felt this way about a metal cd since Machine Head’s The Blackening. Granted, I’m not the biggest metal fan anymore, but this CD had me from start to finish. I haven’t watched the DVD yet, so I can’t comment on whether it is good or not. It was filmed in 2005, so it doesn’t have anything from this album on it. I own a Sepultura DVD of a live show they did, and the energy Cavalera brings on the stage is impressive. So I’m sure the DVD is worth paying a few extra bucks for. The CD also comes with three bonus tracks. All of them are solid, but I can see why they left them off the regular cd. I don’t really want to get into a track by track breakdown, because every song is great. It’d just be repetitive praise. Just know that the lyrics and vocals are great, the guitar work is fantastic, and the drums and bass fit each song perfectly. If you liked Sepultura before Cavalera left, and have ever liked Soulfly, you should definitely buy this CD.